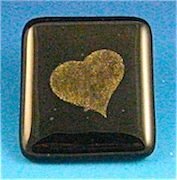 This fused glass mica pendant has been etched with Armour Etch cream to highlight the heart design. 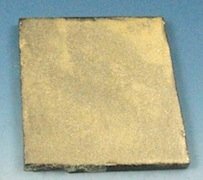 When selecting mica powder for glass fusing, care must be taken to ensure that the powder can withstand kiln firing temperatures. Some powders such as PearlEx are not suited for kiln work and will begin to fade at higher temperatures. Generally any powders intended for cosmetic applications should not be used for glass fusing processes. Suitable powders can be found at many fusing supply stores. 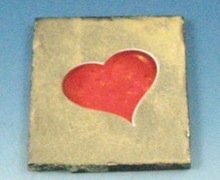 This item is made by painting a mix of powder and A 14 Medium or Klyr-Fire onto a piece of glass and then applying some form of resist to protect the powder from the etching cream. A 14 and Klyr-fire can be obtained from glass supply stores or Thompson enamel. The etched item is then capped with a piece of clear glass. 1. Cut base to size approx' 1 3/4" x 1 1/2", cut clear cap slightly larger. 2. Mix powder, add either A14 Medium or Klyr Fire to produce a painting mixture. Apply mixture to the smoothest glass surface, mix may need to be dabbed on to obtain the best results. 3. Wait for mix to dry. Place on prepared kiln shelf and fire quickly to 1400° F (760° C), hold for ten minutes and then switch off, cool to room temperature. 4. Gently tap sheet to remove any loose powder. Apply some form of resist or stencil to painted surface. The photo below shows a peel off sticker from a sticker sheet. Follow the Armour Etch instructions, apply cream, covering sticker and all of the surface. Wear rubber gloves and safety glasses for this operation. After about ten minutes, wash cream away and remove resist. The surface should be now be matte with design left under the resist. 5. Place clear cap over etched item, fire in kiln up to about 1450° F (788° C). The temperature may need to be lower to ensure the color doesn't fade away. Hold at this temperature until the cap is nicely fused and rounded. Allow to cool, remove from kiln and fit pendant bail.